Pro Shop at Builth Wells Golf Club01982 551155workShop - SportsThe Pro Shop at Builth Wells is very well stocked with top brands at competitive prices. PGA Professional Simon Edwards as well as offering a top class retail outlet is available for golf tuition, club repairs and is an authorised Powakaddy Service Agent. A wide range of men’s and ladies clothing is kept in stock with leading brands such as Under Armour, Calvin Klein, Nike for the men and Green Lamb, Catmandoo and Valerie Herman for the ladies. The Pro Shop offers a range of the very latest golf clubs from manufacturers such as Titleist, Ping, Nike, Wilson along with the award winning MD Golf brand. Golf bags from manufacturers such as Ping, Titleist, Powakaddy, Nike and Sun Mountain. The Pro Shop at Builth Wells is very well stocked with top brands at competitive prices. PGA Professional Simon Edwards as well as offering a top class retail outlet is available for golf tuition, club repairs and is an authorised Powakaddy Service Agent. Buggy hire, electric and pull trolleys are available. Buggies need to be booked especially in the summer months when the course is very busy. pull trolley - £2.00 per round. 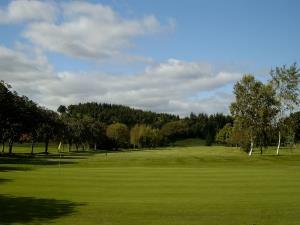 Please note that buggies need to be booked especially in the summer months when the course is very busy.